MBOS is your most useful resource for getting accurate, up-to-date information about your pension and health benefits accounts. When you log on, your MBOS Home Page will open in the Web browser. Here you can link to all of the MBOS Applications that are currently available to active members. You will find buttons that open the MBOS Applications. These applications provide information about your pension account and link you to benefit calculators and online application forms. Additional information about using these applications is provided in the next section. Note: Access to MBOS applications is based upon the benefits provided to you through your employer. Therefore, not all applications are available to all members. This online help page is available by clicking the "MBOS User Guide" button located on the right side of your MBOS Home Page. If you have MBOS access to other pension fund accounts or employer access to the Employer Pensions and Benefits Information Connection (EPIC), you will need to select the "user role" you wish to open each time you log on to MBOS or EPIC. When you are logged on to MBOS or EPIC you may click the "Select Different Role" button to leave the current MBOS session and access your other accounts or user roles. Return to your MBOS Home Page to access other MBOS applications. You should always use the "Home" button (instead of the browser's "Back" buttons, see image below) to return to your MBOS Home Page. Logout of MBOS and end the session. It is important that when you are finished with your MBOS session, be sure to always log out of MBOS to prevent unauthorized access to your account information. The MBOS Home Page displays your name, pension membership number, and the e-mail address on file with the Division of Pensions and Benefits. If your e-mail address has changed or is incorrect, click on the highlighted e-mail address to open the E-mail change page. The page displays the current e-mail address and provides a field where you can enter the new address. Enter your new e-mail address, then click the "Submit" button. Click the "Home" button at the top of the page to return to the Home page and the new e-mail address will be displayed. A confirmation e-mail is also sent for verification purposes to the old and new e-mail addresses. If you are having difficulty registering for MBOS or logging on to your existing MBOS Account, see the detailed MBOS Registration Instructions and the MBOS Registration Help page. Registered users who still have questions about or difficulty using MBOS Applications after reading the information in this User's Guide should contact the Division's MBOS Help Desk at (609) 292-7524 or send an e-mail. If you have comments or suggestions regarding MBOS, please submit them to the Division's MBOS development staff at the e-mail address provided above. The Personal Benefit Statement application allows you to view information about the status of your personal pension account and related benefits. To access to the application, click the "Personal Benefit Statement" button on your MBOS Home Page. Note: Paper Personal Benefit Statements are no longer produced by the Division of Pensions and Benefits. The online Personal Benefit Statement application replaces the former Statement of Account application in MBOS. The page that opens will show your account information, current as of the last quarterly posting by the Division of Pensions and Benefits. On the left side of the page you will find information about pension service credit, your total employee contributions to the pension fund, life insurance coverage status, and an estimate of future retirement benefits. On the right side of the page is your personal identifying information, your date of enrollment, birth date evidence and veteran status, and — if available — information about health benefits coverage under the SHBP or SEHBP and/or enrollment in any supplemental savings programs (State Employees Deferred Compensation Plan, Supplemental Annuity Collective Trust of New Jersey, etc.). 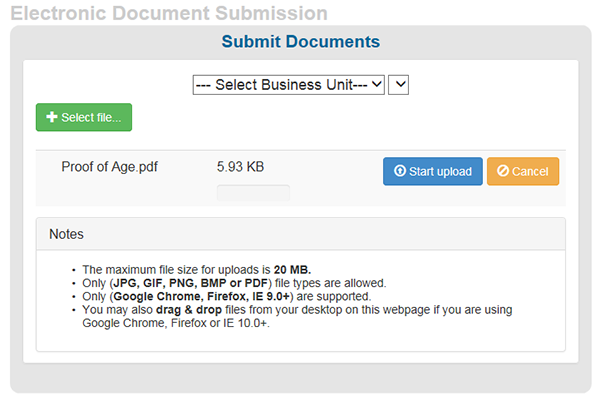 An icon is provided at the top of the page to "Print" a copy of this information page for your records. When you are done, click the "Home" button to exit the Personal Benefit Statement. The Payroll Certifications application allows you to view Certifications of Payroll Deductions issued to you by the Division of Pensions and Benefits. Payroll certifications are issued to authorize the start of pension deductions when you are newly hired, for back deductions due to the Division, pension loan payments, or arrears/purchase payments. To access the application, click the "Payroll Certifications" button on your MBOS Home Page. On the page that opens you can request all certifications or choose only a specific certification (loans, back deduction, etc.). The total number of records available for viewing will be listed in the bottom right table cell. Available certifications are presented in groups of up to five at a time (if more than five certifications are available, navigation buttons to go to the "Next" or "Previous" part of the certification list will be active). Past certifications are archived for up to two years. To view a specific certification, click on the check box that corresponds to the certification you want and then click on the "Details" button. You may also request to view more than one certification by clicking on several check boxes (or click the "Select All" box to view all certifications from this search). Selected certifications are presented one at a time. Navigation buttons will allow you to go to the "Next" or "Previous" selected certification. The Pension Loan application allows you to see how much you may borrow from your pension account, view estimates of different loan and/or repayment amounts, and — if you wish to — submit an online request for processing of a pension loan check. Note: You must have at least three years of pension membership credit posted to your pension account to be eligible for a pension loan. You can borrow from your pension account two times within a calendar year and request up to one-half of the contributions you have posted to your pension account (or a maximum loan balance of $50,000, whichever is less). For information about the present loan interest rate and administration fee, click here. To access the Pension Loan application, click the "Pension Loan" button on your MBOS Home Page. The page that opens contains important information about the rules and regulations currently in effect regarding pension loans. Be sure to read and understand the contents of this page, the Loans Fact Sheet, and the information provided at the link, Internal Revenue Service (IRS) Regulations, before you proceed. Click on the "Agree" button if you agree to comply with the loan repayment terms and conditions. You must agree with the pension loan terms and conditions in order to continue. If you do not agree with the repayment terms and conditions, you may exit the MBOS Loan Application by clicking on the "Disagree" button or the "Home" button on the top right-hand side of the page. The IRS requires a new loan amount, when added to the highest balance due (without interest) during the prior 12-month period for all loans from all employer-provided retirement plans cannot exceed $50,000. This includes retirement plans that an employee may have an interest in due to his or her employment relationship with New Jersey and/or any other governmental plans sponsored or administered by a public sector employer in New Jersey. Amounts received in excess of the maximum permitted by the IRS shall be declared a deemed distribution and subject to additional tax. You must indicate if you have any additional loans. When you click on the "Agree" button, the "Loan Application" page opens. Here you can view the maximum amount that you may currently borrow, the minimum allowable repayment schedule, or request to see different loan amount or repayment combinations. If an error message appears at any time, click here for help in determining the possible problem. Note: State employees paid through the State Centralized Payroll Unit see repayment amounts based on a "biweekly" schedule. All other employees see repayment amounts based on a "monthly" schedule. Click on the "Change Loan Amount" button. The new section shown below will appear at the bottom of the Loan Application page. Click on the "Recalculate" button. The new loan amount and minimum repayment schedule will be displayed on the Loan Application screen. When you have decided on the loan amount and repayment schedule that you want, go to the next step in the Loan Application process by clicking the "Continue" button. To cancel any changes and return to the original maximum loan/minimum repayment calculations, click on the "Restore Max/Min" button. Click on the "Change Payment Amount" button. The new section shown below will appear at the bottom of the Loan Application page. The loan amount along with the revised minimum repayment schedule will be displayed on the Loan Application screen. Note: The new payment amount cannot be less the minimum payment amount available, and cannot exceed 25% of your base salary. Other conditions may also limit the amount you can borrow or your required minimum repayment amount — see the Loans Fact Sheet, and the Internal Revenue Service (IRS) Regulations before you proceed. On the next screen, verify or enter the address to which the Division of Pensions and Benefits should mail your loan check. Note: All loan checks MUST be mailed and cannot be picked up at the Division of Pensions and Benefits. Please double check that your address information on this page is correct. When you are sure that the information is correct, click on the "Process Loan" button. A Confirmation Page will display your name, membership number, the loan amount requested, check date, mailing address, and repayment schedule. A button is provided to "Print" a copy of the confirmation page for your records. An e-mail is also automatically sent to the e-mail address on file with the Member Benefits Online System, acknowledging the receipt and processing of your Loan Application by the Division of Pensions and Benefits. When you are done, click the "Home" button to exit the Loan Application. The Statements and Letters application allows you to send statements or letters to yourself or a third party. To access the application, click on the "Statements and Letters" button on your MBOS Home Page. On the page that opens, first select whether to send the letter to yourself - "Letter to Me" - or send a "Letter to a Third Party". Next, choose the type of statement or letter you wish to send from the drop down menu. Statement and Letter options include Health Benefits Confirmation, Loan Payoff, Retirement Estimate, Account Statement, and Mortgage Verification. Enter the address where you wish the statement or letter to be sent. An optional field for a copy sent by fax is also available. Additional information is requested for letters to a third party. Complete the information on the form and click "Submit". You will see a Confirmation page that your request was successfully submitted. When you are finished, click on the "Home" button at the top of the page to exit the application and return to your MBOS Home Page. The Purchase Calculator application allows you to estimate the cost of a purchase of additional service credit. NOTE: The Purchase Calculator is only for estimating the cost of a purchase. To apply for the actual purchase of additional service credit, use the Purchase of Service Credit application. To access the application, click the “Purchase Calculator ” button on your MBOS Home Page. On the page that opens, select the type of service that you wish to purchase and enter the amount of time (in months) of that service. When you make your selection, you will be presented with a definition of the type of service. Be sure to also read Purchasing Service Credit Fact Sheet for full details on the requirements and limitations for the purchase of any additional service credit. If the selection is the correct type of service that you wish to purchase, click "OK" to continue. If the type of service is incorrect, click "Cancel" and select a different type of service. When you have selected your service type and entered the months of that service, click the "Submit" button. You will see a Results Page which will show the service type, the amount of service time requested, and the estimated lump sum cost. NOTE: Do Not submit a payment based on this estimate. You must complete an application for the purchase of any service credit, and all service must be verified and approved for purchase by the Division. To calculate another purchase estimate, click the "Calculate Another Estimate " button to return to the first page of the calculator. To apply for the purchase of service credit, click the "Apply to Purchase Service" button to go to the Purchase of Service Credit application. To exit the application, click the "Home" button near the MBOS page header. The Purchase of Service Credit application allows you to submit a request for the purchase of service credit directly to the Division of Pensions and Benefits or view the status of a previously submitted request. To access the application, click the “Purchase Application” button on your MBOS Home Page. The page that opens will show the status of any previously submitted purchase requests. NOTE: Purchases that were authorized prior to 2008 will display with a Status of "Expired" rather than "Authorized." We apologize for any inconvenience. To enter a new purchase request, click the "Submit New Purchase Request" button. On the page that opens, enter the information about yourself and the type of service credit you wish to purchase. Note: For additional information about types of service and purchase costs, view the fact sheets that are linked from the bottom of the page. When all of the information has been entered, click the "Continue" button. On the next page you will be asked about the prior employer. For Public Employment with a governmental or educational employer, please enter the name of the employer, the address, your title while employed there, and the dates of employment. For a purchase of Military Service, please indicate the Branch of Military Service and your Dates of Active Service. To list additional titles, employers, or periods of service, for the same type of service, click the "Add New Service Period" button. When you have entered all the information about the employer or military service, click the "Continue" button. All of the information needed for the purchase request should now be entered, and you will be shown a Summary Page. Please review the summary information carefully as this is what will be submitted to the Division of Pensions and Benefits to begin processing of your purchase. If you need to change any of the information shown, click on the "Modify" button to go back and make changes. If any of the information shown is incorrect, you can click on the "Delete" button to remove the information. If all of the information displayed on the Summary Page is correct, click the “Submit” button to submit the purchase request. You will see a Confirmation Page indicating that the purchase request has been submitted successfully. At the top of the Confirmation Page, there is a link to a “Printable Version” of the Summary Page information. You should click this link and print a copy of the summary information for your records. You will also receive a separate e-mail confirmation that the purchase request has been submitted successfully. To enter a request for another type of service, click the "Submit Another Purchase Application" button. To exit the application, click the "Home" button near the MBOS page header. The Purchase Authorization application allows you to authorize the purchase of service credit directly to the Division of Pensions and Benefits. To access the application, click the “Purchase Authorization” button on your MBOS Home Page. The page that opens will show the “Terms of Agreement” for authorizing a purchase of service credit. If you click the “Agree” button, the next page that opens shows the service credit you are able to purchase. Click “Continue” and the following screen allows for changes to the payment or the service period. Once you are satisfied with the payment arrangement and/or service period, click the “Submit” button. You will be asked to verify your submission. You must click “OK” to continue. The next screen confirms your authorization. You will see “CONGRATULATIONS” at the top of the page and any changes you may have made to the payment or service period will be reflected on this page. On this same page you will be asked to “Print” this confirmation at the bottom of the page. To access the application, select the “Online Document Submission” button on your MBOS Home Page. The next screen gives you instructions and lists the types of files that you may upload (e.g., .pdf, .jpg, etc.). When ready, click the “Continue” button. On the next screen, select the “Business Unit” from the dropdown menu ( e.g., Retirements). 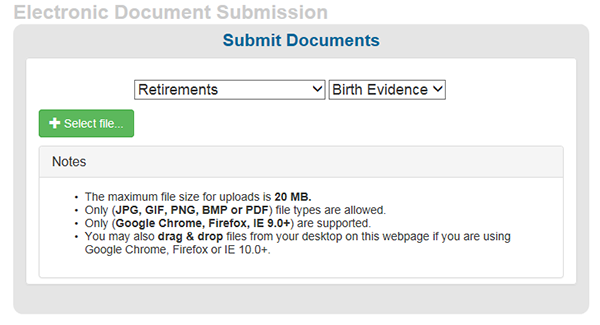 Select the type of document you wish to submit from the next dropdown menu (e.g., Birth Evidence). You may only submit the types of documents listed. From there, click the “Select file” button to search your computer for the document file that you wish to upload. Choose the file and then select “Open” to attach. 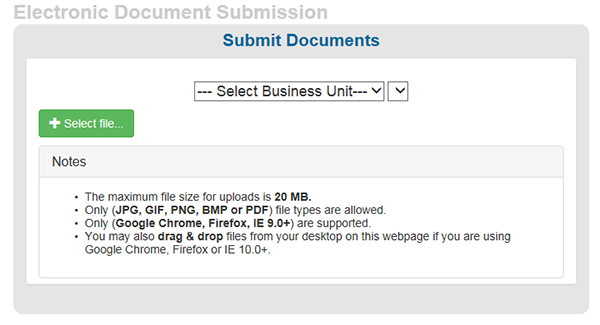 Click the "Start Upload" button to upload your file to the NJDPB. You will see an onscreen confirmation when your upload is complete. 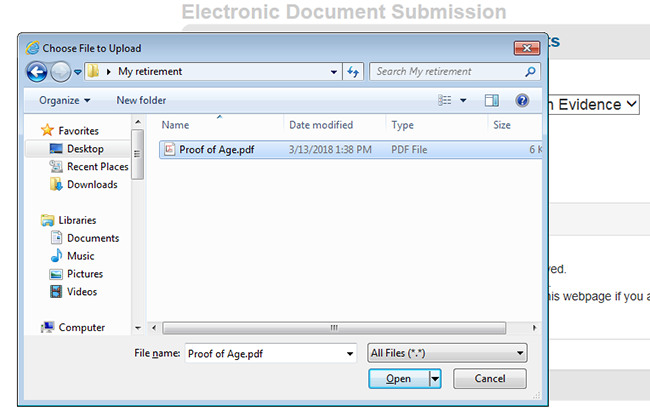 Only one file may be uploaded at any time (although a pdf file may contain multiple pages); if you have additional documents to upload, repeat the steps listed above. Once you receive the confirmation, the document(s) are available for review and approval by the NJDPB. Please do not also mail or FAX the document(s). The "Retirement" button on your MBOS Home Page opens a menu of online retirement sub-applications for MBOS users. These include the Retirement Application, Retirement Estimate, and Retirement Application Status sub-applications. To access any of the online Retirement sub-applications, click the button in the menu. Additional instructions on using the Retirement Application and Retirement Estimate are provided immediately below. Instructions on using the Retirement Application Status are provided later in this guide. The Retirement Calculator application allows you to estimate how much you may be eligible to receive at retirement for any retirement date up to two years in the future. To access the application, click the "Retirement" button on your MBOS Home Page and then the "Retirement Estimate" button on the MBOS Retirement Sub-Application Menu. Select the type of retirement from the drop-down menu. Enter your planned retirement date (All retirements must be for a date no more than two years in the future and must start on the first of a month). Enter the date on which you will terminate employment (must be prior to your retirement date). If you click "Yes" in the "Add Beneficiary" area a box will open where you may include a beneficiary's name, date of birth, and spouse information. Note: By providing this information we will be able to calculate additional pension payment options that include survivor payments (optional). When you have entered all of your information, click on the "Submit" button. The page that opens will show your retirement estimate. Note: All calculations are ESTIMATES ONLY and are based on service and salary information currently posted to your pension account by the Division of Pensions and Benefits. The online Retirement Application allows you to apply for retirement with the Division of Pensions and Benefits. Note: Paper retirement applications are not accepted. All retirement applications must be submitted using MBOS. The first part of the Retirement Application is the same for members of all retirement systems. The second part of the application differs for PERS/TPAF members and PFRS/SPRS members and are described separately in the later sections of these instructions. To access to the application, click the "Retirement" button on your MBOS Home Page and then the "Retirement Application" button on the MBOS Retirement Sub-Application Menu. The first page of the Retirement Application presents the "Acknowledgement of Terms and Conditions of Retirement." To continue, you must read and agree to the "Terms and Conditions." Click the "Agree" button to continue with your Retirement Application. Selecting "Disagree" will end the application process. After you agree to the "Terms and Conditions" of retirement, you will have an opportunity to obtain an Estimate of Retirement Benefits — if you have not already done so. Before applying for retirement, you should obtain an Estimate of Retirement Benefits and consider the pension payment options available to you — and to any beneficiary. The online Retirement Application provides a link to the Retirement Estimate Calculator. To calculate an estimate of benefits prior to completing an application, click the "Yes" button. If you already have an estimate and you are ready to complete your application, click “No” to proceed to the Retirement Application form. The Member Information page asks about you, the member. Please complete all of the requested fields. Some fields may be pre-filled. If any of the pre-filled information is incorrect, it can be corrected. After you have entered all of the information for this page, click the “Continue” button. On the Select Retirement Type page, enter your “Retirement Date” and “Retirement Type”. Because all retirements begin the first day of the month select only the retirement Month and retirement Year from the drop down lists. Then select your “Retirement Type” by clicking a selection button. Only ONE type of retirement may be selected. Note: Click on the “question mark” icon next to “Retirement Type” to open a page with detailed explanations of each type of retirement. If you select Ordinary Disability or Accidental Disability Retirement, a field will open where you should enter additional information about your disability. Please note that all disability retirement information submitted to the Division is kept strictly confidential. You must also answer the question about any pending purchase of service credit. PERS and TPAF members must also answer the question about the last or highest years of salary. Most PERS and TPAF retirements are calculated using the last 3 years of salary (5 years for Tier 4 and Tier 5 members) – which are usually the highest. If your last 3 or 5 years are not the highest salary years, select “No” and additional fields will open where you will enter your highest fiscal years of salary. A fiscal year runs from July 1st through to June 30th. Note: The next pages of the application differ depending upon your retirement system. The PERS and TPAF are discussed first with the PFRS and SPRS following. The Option Selection page will open. You will need to select a pension option and name your pension beneficiary. The pension options provide for varying amounts that can be paid to you, and to your named beneficiary after your death. Click on the “question mark” icon next to “Select Pension Option” to view detailed explanations of each pension option. You may choose only ONE of the 9 different options that are offered. At the bottom of the page, you must enter the information for your pension beneficiary. This is the person who will receive benefits from your option selection. If selecting the Maximum Option, please be sure to name a beneficiary. Doing so will not change the amount of the maximum calculation; however, in the event of your death, the named beneficiary will receive the "last check benefit" and/or any uncollected pension contributions. When the pension option and pension beneficiary section is completed, click the "Continue" button at the bottom of the page and you will go to the Life Insurance Beneficiary page. On a following page you will also be asked to list information for any dependent children. On the Life Insurance Beneficiary page you are required to list information about one or more beneficiaries for any Group Life Insurance payable upon your death. When you have entered all of the information for this page, click the “Continue” button. All of the information needed for the Retirement Application should now be entered, and you will be shown the Summary Page. Please review the summary information and selections carefully as this is what will be submitted to the Division of Pensions and Benefits to begin processing your retirement. If you need to change any of the information shown, click on the heading of any section to go back and make changes. You can also click the "No" button at the bottom of the page. If all of the information displayed on the Summary Page is correct, click the “Yes” button at the bottom of the page to submit the application. You will see a Confirmation Page indicating that the application has been submitted successfully. At the top of the Confirmation Page, there is a link to a “Printable Version” of the Summary Page information. You should click this link and print a copy of the summary information for your records. You will also receive a separate e-mail confirmation that the application has been submitted successfully. After an online Retirement Application has been submitted (but before the retirement date) MBOS users are permitted to change the retirement date, type, or option by canceling their application and submitting a new one. Please note that resubmitting a new application after its initial submission may significantly increase the required processing time. To access the application, click the "Retirement" button on your MBOS Home Page and then the "Retirement Application" button on the MBOS Retirement Sub-Application Menu. On the introductory screen of the application, click the “No” button skip the retirement estimate and go directly to your retirement application. Next you will be presented with the "Acknowledgement of Terms and Conditions of Retirement." You must agree to the "Terms and Conditions" to continue to your previously completed application. If a prior retirement application has been submitted, you will be taken directly to the Summary Page. To assure proper processing of your change, you must cancel your existing application and submit a new application. On the Summary Page, click the "Cancel Application" button. Once you cancel the application, submit your application again, using the new choices you wish to make (different retirement type, option, etc. ), by clicking the "Retirement Application" button on the MBOS Home Page. You will receive an e-mail that the initial application has been canceled, and later a separate e-mail confirming that the new application has been submitted successfully. The Designation of Beneficiary application allows you to review and, if desired, change your designated beneficiary(ies) for any payments upon your death for Group Life Insurance and/or Pension account funds. 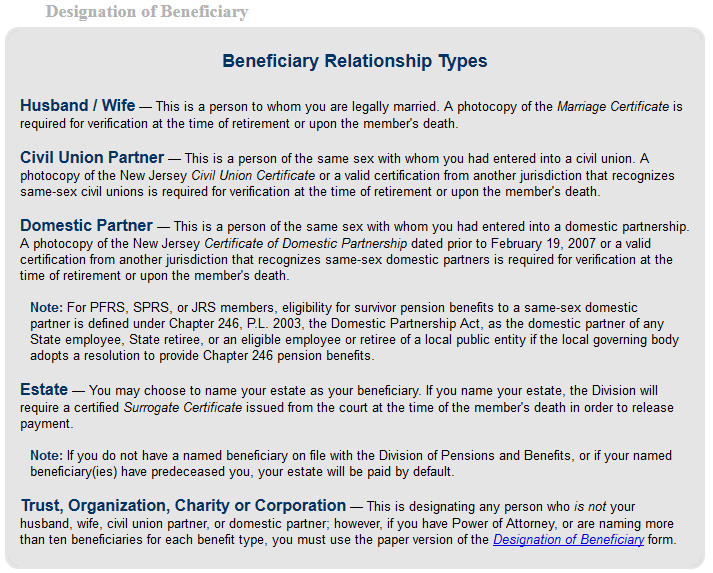 To access the application, click the "Designation of Beneficiary " button on your MBOS Home Page. The page that opens will display the current beneficiary information you have on file with the Division of Pensions and Benefits. A link is provided to a printable version of this information so that you may retain it for your records. Note: If beneficiary information has not been updated since before 1987, users may receive a message indicating "beneficiary information unavailable" because it is not accessible to the online system. The message includes additional instructions for contacting the Division to obtain beneficiary information. Below is an explanation of the different types of beneficiaries. Please note that if you have Power of Attorney, or are naming more than ten beneficiaries for each benefit type, you must use the paper version of the Designation of Beneficiary form. If you wish to change, add, or delete any of the beneficiary information shown, click on the "Change Beneficiaries" button. A page will open with additional information and the "Do's and Don'ts" of beneficiary designation. Be sure that you read and understand this information before you click the "Continue" button. On the next page a summary list will appear. Click the "Modify" button to change any information displayed for a currently listed beneficiary. Click the "Add Beneficiary" button to add a new beneficiary to the existing list. Check the "Delete" box and then the "Continue" button to remove the beneficiary from the list. If you choose to "Add" or "Modify" your beneficiary information, a form page similar to the one below will open. Enter the beneficiary information requested on the form. When finished click the "Continue" button. Please note: Social Security numbers are optional, however, when provided the inclusion of a correct Social Security number will help to speed processing in the event of a claim. Before completing your changes, you will be able to review your new beneficiary information on the verification page. The verification page will display the new beneficiary information and will also indicate any information that is being deleted from your beneficiary record. Please review the information carefully to assure that it is correct. If any of the information requires further changes, you may make them now by clicking the "Change Beneficiaries" button. If the information displayed is correct, click the "Submit" button to complete the transaction. You will see a confirmation page to indicate that your Beneficiary Designation has been submitted successfully. At the top of the confirmation page is a link to a "printable version" of the page. You should print and keep a copy on this confirmation for your records. The Application for Withdrawal allows members who have terminated employment (but who have not applied for retirement) to withdraw their contributions from the retirement system. Before completing the Application for Withdrawal, please read the information about withdrawal in the Withdrawal from the Retirement System Fact Sheet and on the Frequently Asked Questions About Withdrawal page. By withdrawing from the retirement system you forfeit all benefits other than the return of contributions. If you are eligible for a retirement benefit, you will be given the option to review an estimate of that retirement benefit before continuing with a withdrawal. Some portions of the withdrawal may be subject to federal tax. See the Tax Information for Pension Distribution Fact Sheet. Your decision to withdraw cannot be rescinded once the completed Application for Withdrawal is submitted. To exit the Application for Withdrawal, anytime before your final submission, click on the "home" button at the top of the MBOS page. All withdrawals are subject to verification with your former employer(s). See the Withdrawal from the Retirement System Fact Sheet. To access the application, click the "Application for Withdrawal" button on your MBOS Home Page. On the first page that opens will be important messages related to the withdrawal of your retirement system account. Be certain that you read and understand the information presented before you complete the Application for Withdrawal. f you are uncertain about any of the information, see the Withdrawal from the Retirement System Fact Sheet, the Tax Information for Pension Distribution Fact Sheet, and the Frequently Asked Questions About Withdrawal page. When you are ready to submit your Application for Withdrawal, click the "Continue to Withdrawal Application" button. On the next page, enter your current mailing address and the information requested about your termination of employment. When done, click the "Continue with the Withdrawal Application" button. If you are receiving periodic benefits under Workers' Compensation, or have a Workers' Compensation claim or litigation pending, applying for a withdrawal may jeopardize those benefits. To continue with your withdrawal, you must complete a waiver of any pension benefits associated with a Workers' Compensation award. See the Workers' Compensation Fact Sheet, for more information. If you are eligible for a retirement benefit, you must complete a waiver of that retirement benefit in order to continue with the withdrawal application. After you have made your selection, click the "Continue with the Withdrawal Application" button. Before completing your withdrawal, you will be able to review your distribution selections and the other information to be submitted. You will have the opportunity to change the distribution or address information shown by clicking the "change" buttons. If you wish to exit the Application for Withdrawal without submitting it, click on the "home" button at the top of the MBOS page. To complete your Application for Withdrawal, click on the "Submit the Withdrawal Application" button. You will see a confirmation page to indicate that your Application for Withdrawal has been submitted successfully. At the top of the page is a link to a "printable version" of the confirmation page. You should print and keep a copy on this confirmation for your records. Clicking on the "Deferred Compensation Information" button takes you directly to the New Jersey State Employees Deferred Compensation Plan (NJSEDCP) Web site. 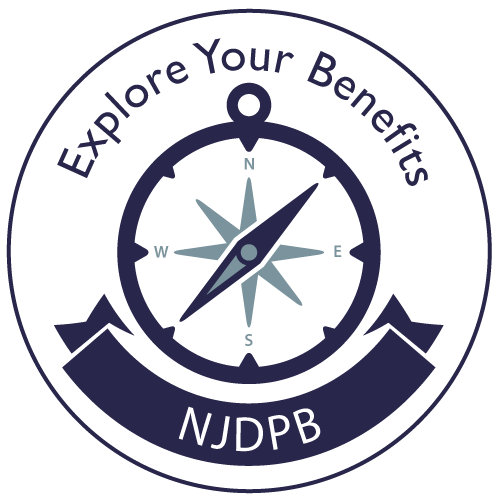 On the NJSEDCP Web site you can find your personal Deferred Compensation Plan account information, investment information, and forms and other publications that relate to the NJSEDCP. The NJSEDCP and its Web site are administered for the State of New Jersey by the Prudential Insurance Company. The Supplemental Annuity Collective Trust (SACT) Plan Information application allows you to view SACT account information if you participate in SACT. To access to the application, click the "Supplemental Annuity Collective Trust" button on your MBOS Home Page. The page that opens will show account information current as of the last quarterly posting by the Division of Pensions and Benefits. By clicking on the "SACT Unit Values" box, you can access the unit values of the investment fund for the past quarter. The Health Benefits Programs application allows you to view health benefit account information for you and your enrolled dependents, if enrolled in the State Health Benefits Program (SHBP) or the School Employees' Health Benefits Program (SEHBP). To access the application, click the "SHBP/SEHBP" button on your MBOS Home Page. From the "Subscriber/Eligibility" page, select your account by clicking on the "Employer ID" number. The page that opens will show your Eligibility Summary, Coverage Information, and Dependent Information. To view the history of your SHBP/SEHBP account, click the link "Click here to view coverage history". Clicking the "Next" button will show additional pages of coverage history. To return to the Eligibility Summary screen, hit the "Back to Subscriber Information" button at the bottom of the Previous Coverage page. To view details about a dependent's coverage, click on the linked name of a covered dependent. Click the "Next" button to view additional Dependent Detail. To return to the Eligibility Summary screen, hit the "Back to Subscriber Information" button at the bottom of the Dependent Detail screen. If you have applied for retirement, the Retirement Application Status application allows you to check the status of your application. To access the application, click the "Retirement" button on your MBOS Home Page and then the "Retirement Application Status" button on the MBOS Retirement Menu Page. The page that opens will show the date the retirement application was received by the Division of Pensions and Benefits, the retirement date, and the date of receipt of the employer's Certification of Service and Final Salary. If available, the list will also include the date the quote letter was prepared and mailed and the date the retirement will be presented for approval to the pension fund's Board of Trustees. The Electronic Funds Transfer (EFT) application allows you to set up EFT or direct deposit of your pending monthly pension payment. To access the application, click the "Electronic Funds Transfer" button on your MBOS Home Page. The page that opens will ask if you wish to begin a new EFT Authorization. Click the "New EFT Authorization" button to begin the process. A page will open with form fields and detailed instructions on how to enter your bank information. Please check that the requested information is correct and click the "Continue" button. A Summary page will follow that displays the bank and account information. To make any corrections, click the "Back" button. Otherwise, click the "Submit" button to complete processing of your EFT request. A final confirmation page will be shown. Click on the "Home" button at the top of the page to exit the application and return to your MBOS Home Page.